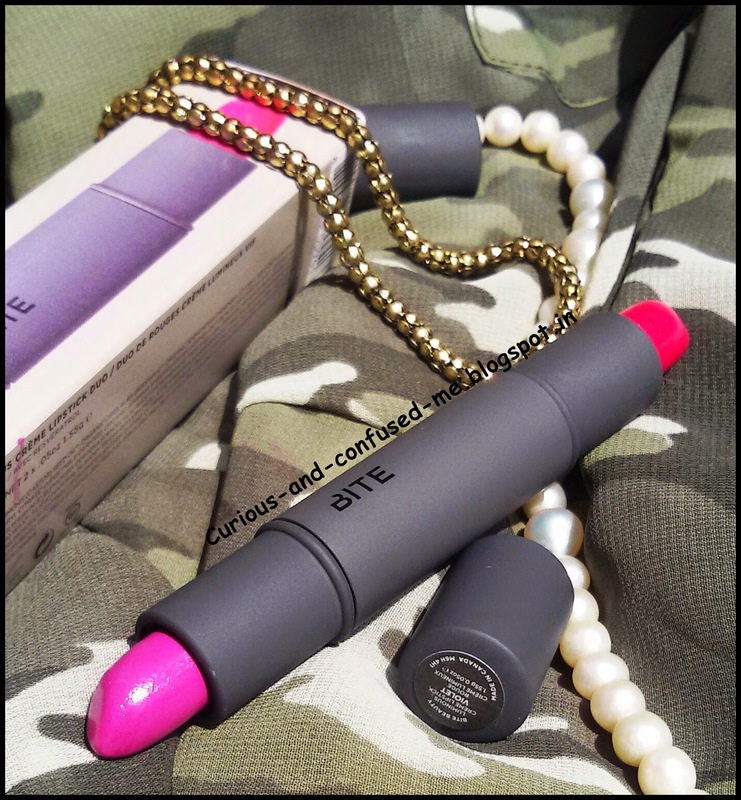 Posted on February 15, 2015 by Swathi Bhat wrote in Bite Beauty, Lips, lipstick, Pink lipstick, Purple lipstick. It has 0 Comment. This Bite Beauty Luminous Crème Lipstick Duo in “Vivid” is the gift from my bestie. Sad part is that they are not available in India yet, good part is that I found a dupe for them in my lippy collection. I am a Berry pink and purple lipstick person you see. Also the review as you never know you might get a chance to pick them up in future. 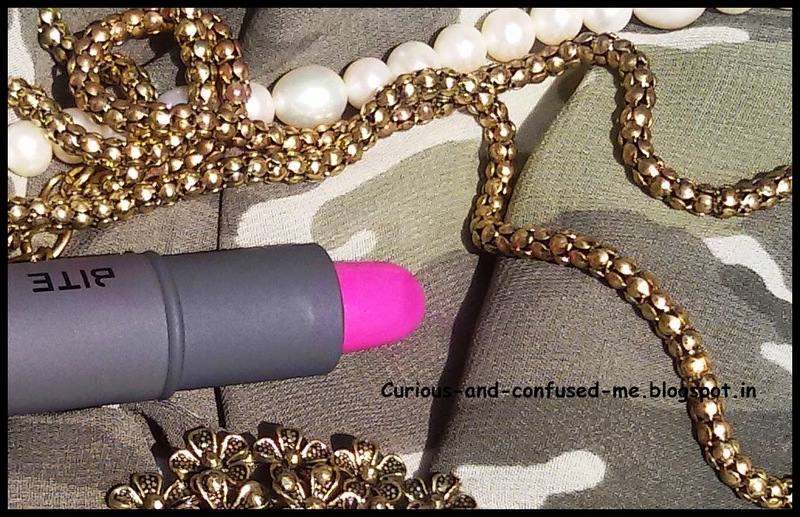 – It’s a dual ended lipstick encased in matte black packaging which feels rubbery. It is cute and is travel friendly. – One of the color is called “Violet” which is a purple and other is called as “Palomino” which is a bright magenta. One swipe and the bullet shade is on the lips, covering all the lip pigmentation. Both the shades are insanely pigmented. -I have worn these with and without lip balm, but I feel there is no need of it. The lipstick is moisturizing and light. You don’t feel the lipstick on lips. 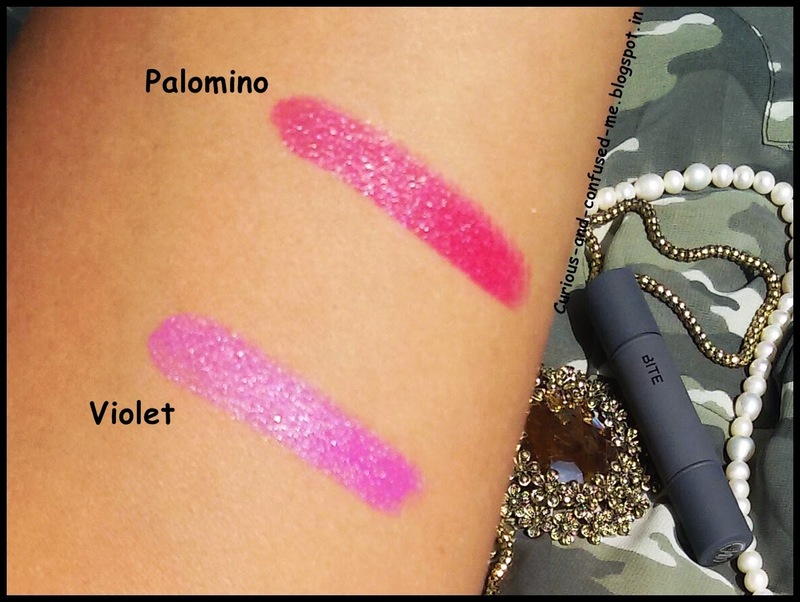 -Both are creamy, glides on lips effortlessly and end up giving glossy finish to the lips. -It stayed on 4+ hours on me. It survived a light snack but not a full meal. Both of the shades leave a lovely tint behind. The tint can be removed easily with the makeup remover. -It has some mild scent to it, I cant relate it to anything but it does not bother and don’t even last 3 seconds after the application. -It does not settle in to fine lines. -They melt under the heat. I don’t find anything wrong with these lippies, it’s my new bestfreind while travelling ( I would end up taking all of Pink/Purple lippies for 1 day trip ). It’s a gift but even if I would have purchased them I would have been super happy as they are worth the money. 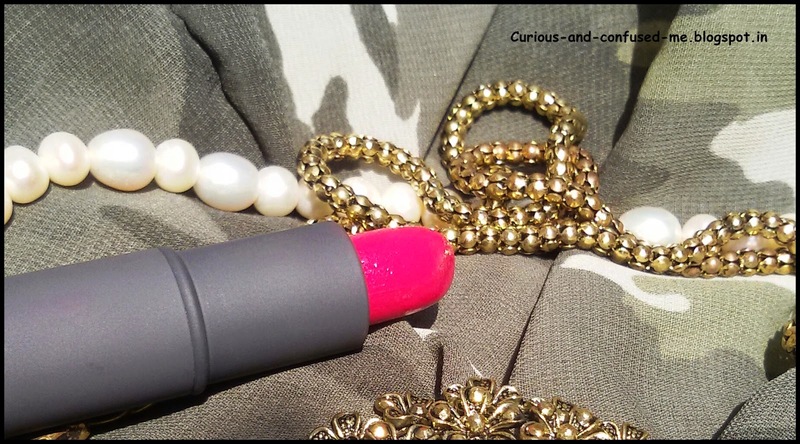 Plus these lipsticks are formulated without parabens, sulfates, phthalates. Will I repurchase: If I get a chance, I will buy many thing from Bite Beauty . Will I recommend: The full sized products are on the pricier side, but grab them if you can. These are one of the good lipsticks around which feels luxurious. For “Palomino” it’s Rimmel london apocalips lip lacquer in “Apocalyptic”. Also Revlon superlustrous “Cherries in the snow”, comes out imilar on the lips. For “Violet” it’s FACES Ultime Pro Lip Creme in “Grape Martini”. You can view the review here: Grape Martini. Also, there is one Maybelline colorshow lipstick which is a lighter version of the shade, sorry I do not remember the shade name but the lipstick packaging has a purple band on it. The dupes might not be equivalent to the quality of Bite lipsticks but they are not less either. They are creamy, pigmented long lasting and affordable too. The Faces lip creme is available easily whereas the Rimmel one isn’t wildly available. You can go for the Revlon one too. 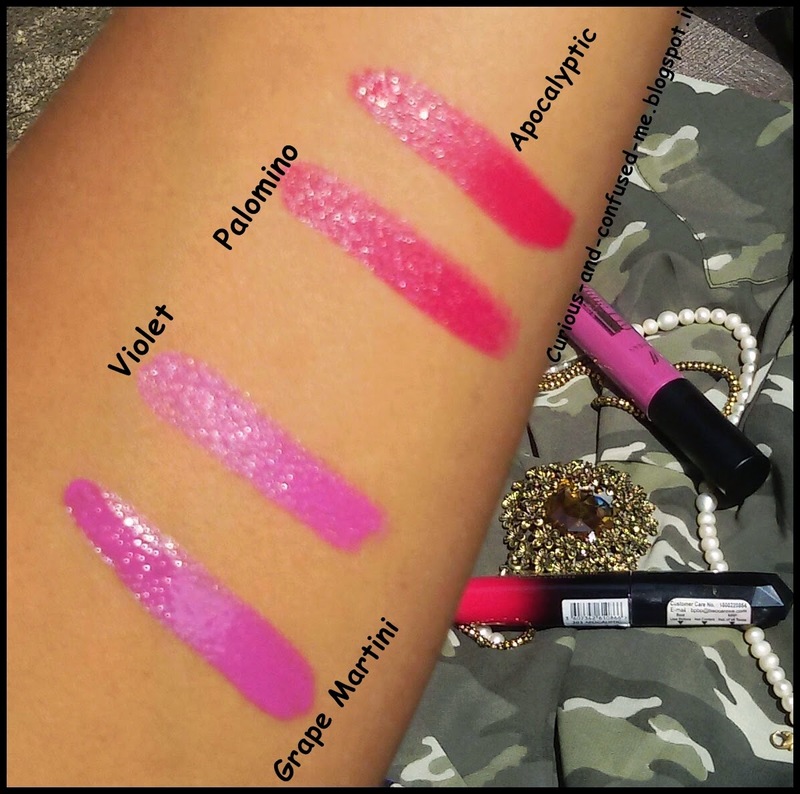 What you think about these lipsticks? Have it, eyeing on it? Do share…. Dalan d´Olive Showergel :Does it give 24 Hour Moisturization? 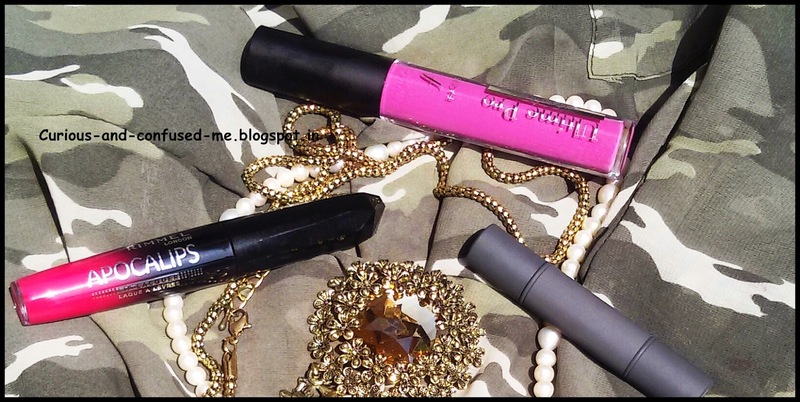 Maybelline The Colossal Liner in Black : One word ” Awesomesause” .